This time has come: Daniel had to move out of his crib into a new toddler bed. We knew this was coming: he is a very active - and somewhat impatient- 21-month old, and he had started to try to climb out of his crib last week. We were hoping that it would take him at least until this weekend to perfect his technique, and we were planning to take advantage of the weekend to make some arrangements in the room to avoid a major fall. Well, Daniel was quicker than we thought: on Wednesday he climbed out of his crib and fell off. Fortunately, he didn't have any major injury. But he had gotten so scared that he didn't want to get into his crib any more. He ended up taking his nap in our bed. So, we took the opportunity to rush to Ikea and buy him a toddler bed. How excited he was when he saw the red bed and red comforter with animal patterns! I think he realized that he now had a bed like mom and dad, and loved it. He couldn't stop climbing in and out of the bed, rolling on the comforter and talking very excitedly about the new bed. The old crib was definitely a thing of the past! 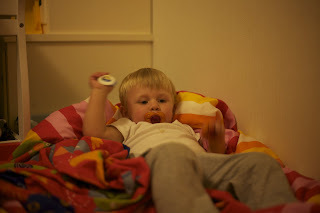 Our main concern was whether Daniel would want to stay in bed once we put him to bed at night. He had been pretty good with going to sleep by himself once in the crib. But we were wondering if he would want to take advantage of the fact that he can now climb out of the bed by himself. We had heard a lot of stories of kids constantly getting out of bed once given the opportunity. It's been 3 evenings now, and Daniel has continued to fall asleep by himself. Granted, he complains for a few seconds when we put him to bed, trying to get us to read just one more book or play with the trains for a few more minutes. But so far, once he understood that it was bedtime, he stayed in bed... and slept well all night. We hope this pattern is going to continue. Or did I just jinx it by claiming success too soon? Congratulations to Daniel for being a big boy now!